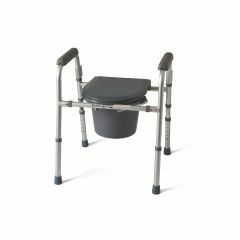 AllegroMedical.com presents The Folding 3-In-1 Commode. Folding frame design assembles in seconds without tools. Commode folds down to reduce storage space by 35% and makes delivery easier. All models include pail, lid and splash guard. Clip-on seats can be removed for easy cleaning. Made of aluminum or steel with weight capacities between 250 and 350 lbs. Seat depth, 16" (41 cm); Width between arms, 19" (48" cm); Overall width, 21.25" (54 cm). Seat height is adjustable.